In conjunction with our friends at Tactic, we're delighted to be giving away a Mölkky outdoor game (RRP £24.99) to four lucky winners in an exclusive competition launching soon. Join our newsletter to be informed of this competition's launch! 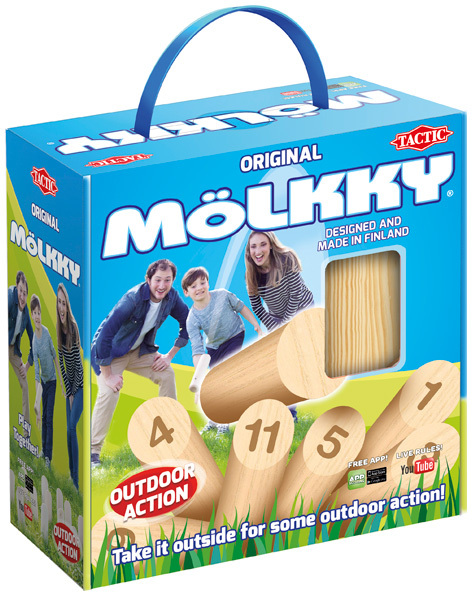 Mölkky is Europe's top selling outdoor game and we can see why. Manufactured in Finland, this eco-friendly and easy-to-learn skittle-throwing game is incredibly addictive and has numerous award wins to its name. This is a durable and environmentally friendly game for everyone, regardless of your age or fitness level. It can be played by 2 or more friends aged 3 and up - and all you need to play is a little patch of grass, sand or playground. Setting up is a synch. Simply arrange the skittles in a tight formation, mark off a throwing line and decide who throws first! As the skittles are knocked down they are stood up again in the same place they landed, meaning the target area gets bigger and more spread out. The winner is the first to score 50 points. Please tell us what you think of Mölkky by Tactic.